← Beef 'Doner' with Cucumber, Tomatoes & Yogurt Sauce. Cut the tomatoes and cucumbers into ¼-inch cubes and transfer to a medium salad bowl. Shave leaves off the parsley stems; discard the stems and mince the leaves. Add to the medium salad bowl with the cucumber and tomatoes to make the salad. Juice the lemon, add half of the juice to the salad and put the other half aside in a small bowl. Add oil, salt, pepper to the salad; stir to combine. Combine oil, cumin, paprika, salt, pepper, crushed red pepper, and two thirds of the garlic in an another medium bowl to make the marinade. Peel and small dice the onion; transfer to the marinade bowl with the oil and spices. While the pan heats up, pat the beef dry with paper towels, then cut into 1-inch chunks. Add to the bowl with the marinade; stir until well combined. Once the skillet is hot, add oil and swirl to coat the bottom; add beef mixture. Cook, stirring occasionally, until onions are soft and beef is cooked through, 4-6 minutes. Toast pita bread if desired. To the remaining lemon juice, add yogurt, salt and one-third of the garlic. Whisk to make the dressing. 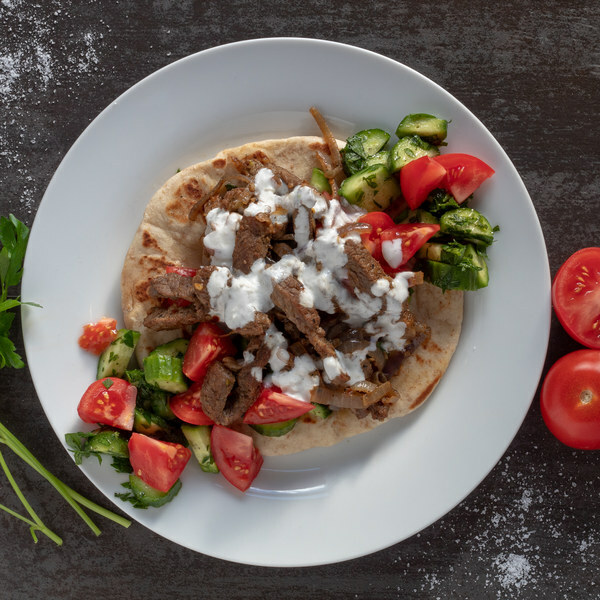 To serve, place pita bread on a plate and top with beef, salad and yogurt dressing. Enjoy!